BOEHNER IS DUMB. PLUS HE DOESN’T LOVE AMERICA. 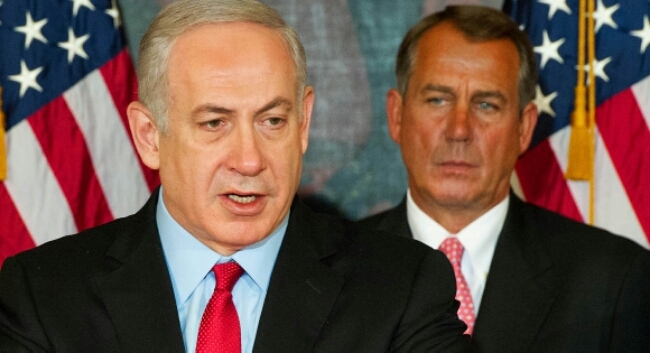 As pressure against Israeli Prime Minister Benjamin Netanyahu’s proposed US visit to address a joint session in Congress grows, I can’t help but think how US Speaker John Boehner—the person who extended the invitation to Netanyahu—doesn’t seem to behave with the rationality or intellect that would befit the third most powerful government official in America. And since Boehner’s goal is to deploy an outside agent to hijack and squash the current nuclear talks with Iran by using Congress as a fulcrum, I have to wonder if Speaker Boehner loves his country. To dig my point, it’s important to understand that we will likely see another war in the Middle East if the current nuclear talks do not conclude with a deal in which the West receives security assurances that Iran will not develop nuclear weapons, and Iran receives sanctions relief. But forget about weapons for a half-minute—Prime Minister Netanyahu has no interest in Iran possessing ANY nuclear capability—not even a nuclear plant to light a building, let alone multiple plants to power cities. This means following Israel’s playbook for talks will lead to no deal. And no deal will only push Iran further away from the US. If Iran can’t “talk” its way into shaking the economic sanctions placed on it by the West as a result of the country’s nuclear power program—particularly when Iran has broken no law to deserve these sanctions, and there’s no evidence that Iran is currently building nuclear weapons—Iran’s hardliners can easily make the case that negotiations are a waste of time. Plus, having no nuclear power plants sounds as ludicrous to Iran as it would sound to Israel, if anyone ever asked the latter to quit enriching uranium. Stop its nuclear program today. I don’t see this being an option since Iran is a signatory to the Non-Prolifiation Treaty while Israel possesses nuclear weapons and has never signed the NPF. The disparity will not permit Iran to stop the program. Move even closer to Russia and China as a way to help strengthen its economy, and arguably national security. Begin developing nuclear weapons as a way to freeze the West or produce a bargaining chip—a move which will surely lead to a war first. Commit a dramatic military act as a way to earn respect or sanctions relief. As I mentioned many times before, a war between the US and Iran will likely pull in Syria and Hezbollah. Plus, I can’t predict how Russia or China will react since they may fear that regime change in Iran will threaten their own interests. In any case this will not be a small war. Plus, a war with Iran will be a costly adventure with a questionable benefit since the country does not currently present an existential threat to the US or Israel. At worst, a war can create a global depression and a high number of American casualties—once again with doubtful upside potential. So, back to Boehner. Armed with this background, he still wants Netanyahu to speak to Congress as a way to shape American opinion about Iran’s program, and force the White House to take the kind of stand with Iran which will make the current talks implode? And then risk another senseless war that can kill many times more US troops than both Gulf wars and the recent Afghan war combined? Besides, when I last checked, Americans—while highly supportive of Israel’s existence, —typically don’t place Israel on their list of top priorities on election day. However, Pro-Israel lobbies are heavy political donors. And this is why Boehner is doing dumb stuff. Risking a war seems unimportant to him—not when cash, a professional politician’s heroin—is involved. This entry was posted in Politics, War and tagged Benjamin Netanyahu, Hezbollah, Israel, john boehner, nuclear talks, strait of hormuz, Syria. Bookmark the permalink. 1 Response to BOEHNER IS DUMB. PLUS HE DOESN’T LOVE AMERICA.